In a dramatic twist on Tuesday, a Federal High Court sitting in Abuja ‘severed’ or judicially separated the trial of Nnamdi Kanu (the leader of IPOB) from that of the other three defendants initially charged with him. The severance was pursuant to an application by motion on notice filed by Barrister Aloy Ejimakor, counsel to one of the three sureties, Jewish Chief Priest, Shalum Ben Madu. Addressing the court, Aloy Ejimakor contended that his client wished to be heard first on the motion he filed before any trial can arise. Ejimakor further stated that his motion is supported by new facts and points of law that required an adjournment of Kanu’s trial and a separate hearing. The severance means that Kanu’s trial has been effectively put on hold until issues surrounding his whereabouts since September last year are resolved. And through the new legal maneuver made by Barrister Ejimakor, it also now appears that Kanu’s trial has taken second place to the issue of his fate since after the reported army attack at his home in Abia State. Trial for Kanu’s three co-defendants has been set to start separately on March 21, 2018 on an amended charge that will exclude Kanu as a co-defendant. 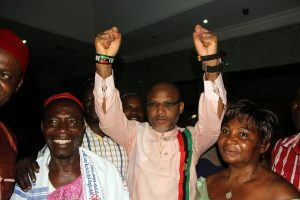 All counsel in the matter who were in court, including Kanu’s lawyer, Barrister Ifeanyi Ejiofor and Barrister Chude representing one of the sureties agreed with the unprecedented ruling, which has the effect of a temporary respite for Nnamdi Kanu, who was until today facing the prospect of revocation of his bail.